After severe losses earlier this week, oil markets traded flat yesterday and remains subdued today. Crude oil is trading flat despite a larger-than-expected decline in crude stocks this week. Oil is struggling to stay above $50 per barrel, opening this morning at just $50.16. Prices have had some gains since opening, but remain just 30 cents away from the psychological $50 level. Diesel prices are up slightly from yesterday, nearly regaining the small losses seen yesterday. Prices gave up 1.6 cents throughout the trading session, ending the day at $1.7505, the lowest close since Sept 12. Prices opened even lower, but have since moved higher to $1.7578, a .73 cent gain. Diesel’s weakness is attributable to lower underlying crude prices. 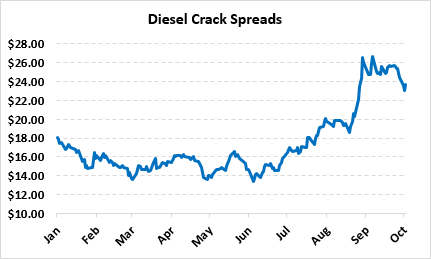 Diesel prices remain elevated relative to crude oil – the diesel crack spread, or the margin of converting a barrel of crude to diesel fuel, has risen from a 2017 range around $15-$18 to over $20 per barrel. While spreads have fallen from post-Harvey peaks, diesel prices remain elevated relative to crude oil prices. Gasoline prices have been uneventful, trading up a penny yesterday and hovering close to yesterday’s close. Prices actually dropped by roughly 1.5 cents overnight, leading to an opening price today below yesterday’s close, but markets have since recouped their losses. Gasoline prices are $1.5629 this morning, a mere quarter-cent below yesterday’s close. The API released their weekly inventory report yesterday, which was generally bearish. Crude oil posted substantially larger stock declines than expected, which should have propelled markets higher, but the effects could not overcome gasoline’s 4.9 million-barrel(MMbbl) stock build. Diesel stocks movements were also weaker than expected, falling just .6 MMbbls. OPEC has been creating ripples in the market this week. The secretary of the organization indicated that compliance with production cuts has been extremely high. Rumors are coming out from various oil ministers that could send markets higher again. The Venezuelan oil minister noted that more countries (as many as sixteen) are being recruited for the deal to help control oil prices, and just this morning Russian President Putin supported extending the cuts through the end of 2018. OPEC has talked up the market without taking action before, but they do occasionally come through on their rumors. They’ve done an excellent job keeping everyone guessing over the past year. 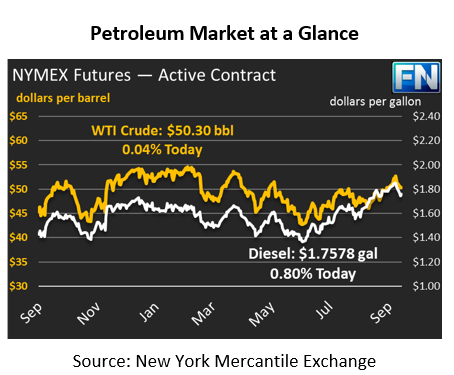 Markets thrive on volatility, and OPEC been a major source of uncertainty for the past year.